Vancouver, BC - Skyharbour Resources Ltd. (TSX-V: SYH) (OTCBB: SYHBF) (Frankfurt: SC1N) (“Skyharbour”) confirms that it has filed a Technical Report and Mineral Resource Estimate prepared in accordance with Canadian Securities Administrators’ National Instrument 43-101. The Report may be found on the Company website or under the Company's profile at www.sedar.com. 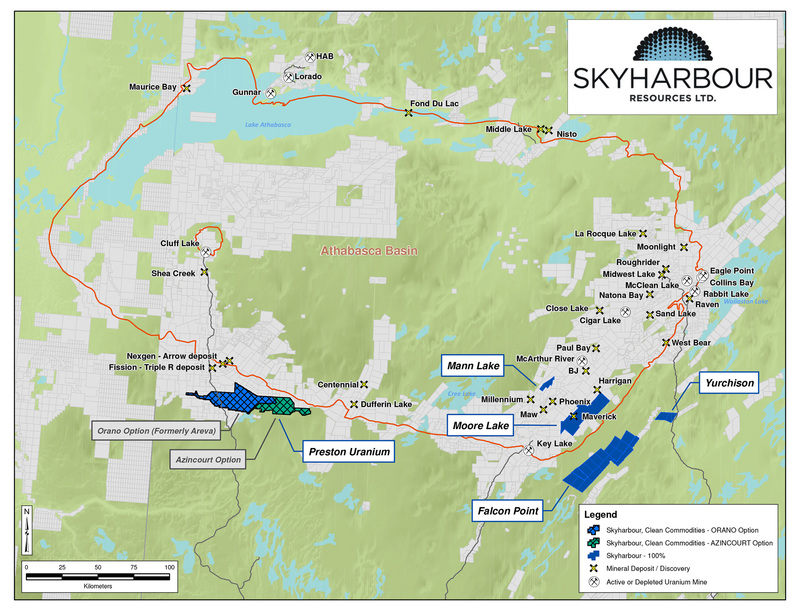 Skyharbour’s 100% owned, 79,003 hectare Falcon Point Uranium and Thorium Project (previously named Way Lake) is located 55 kilometers east of the Key Lake Mill. The project hosts the JNR Fraser Lakes Zone B deposit which consists of a current NI 43-101 inferred resource totaling 7.0 million pounds of U3O8 at 0.03% and 5.3 million pounds of ThO2 at 0.023% within 10,354,926 tonnes using a cutoff grade of 0.01% U3O8. The independent NI 43-101 technical report dated March 20, 2015, entitled “TECHNICAL REPORT ON THE FALCON POINT URANIUM PROJECT”, was issued by GeoVector Management Inc. supporting the mineral resource estimate filed on SEDAR on March 20, 2015 by Skyharbour Resources. Independent qualified person, Dr. Allan Armitage, P.Geo., is responsible for the contents of the technical report and comments related to the resource estimate and its parameters.